Distinguished a class apart, Engineers Institute of India offers best in the domain classroom programs. Our classrooms possess the best inventories required to facilitate an optimum learning environment. Well lit, air-conditioned classrooms accompanied with projector facilities puts us a class apart when it comes to GATE Tutoring. Our teachers are trained to stress on delivery of lectures in as comprehensive manner possible so that the student is able to catch every concept starting from the basics till the advanced. Our regular classroom program hosts periodic tests – both subject-wise and full syllabus to keep the students aware of their preparations. For students who cannot attend our Regular and Weekend classroom programs, our summer course is available for college students of 2nd, 3rd and final year. In our summer course, you will get an opportunity to utilize your vacations in the best way possible by preparing for GATE/PSUs. 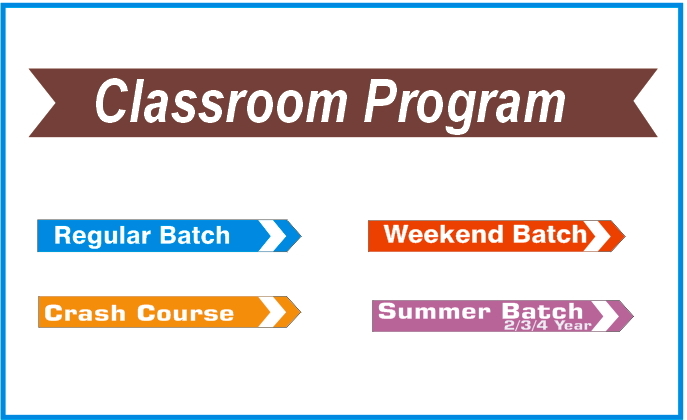 Syllabus for our summer classroom batch has been designed by our experts by paying close attention to the timeline and GATE latest syllabus. Our Summer Course students are given take-home test papers to analyze their progress in order to map their knowledge with other students enrolled with us. It is never too late to start preparing for an exam as humongous as GATE. To cater to the needs of students of 2nd year, 3rd year, final year and working professionals, Engineers Institute of India hosts weekend classes with custom made syllabus. Our custom made syllabus is as exhaustive as our Regular program so that every enrolled student of Engineers Institute is at the same page. Our weekend program spread over a duration of 11- 12 months comes as an aid to those aspirants who do not have time during the weekdays and want equal content. Our weekend classroom assessment test will be synced with all other batches to gauge your strengths & weakness in competition. We at Engineers Institute provide Crash Course program for final year and Engineering graduates who aim to crack the following GATE Exam. Our Crash Course content is designed by normalizing its theory and numerical with content provided to all other batches. A Crash Course student takes numerous tests during his term of study and his performance is evaluated with respect to all enrolled students. Our Crash Course batch consists of highly competitive students in order to facilitate the best learning environment for students who wish to speed-prepare for GATE Examination. We provide Classroom notes and study materials which helps to revise at quick level and enhance scoring abilities. 1. Student who scored 42 to 55 marks in GATE will get 10% discounts on tuition-fee. 2. B.Tech / B.E degree with 80% overall marks or equivalent cgpa will get 10% discounts on tuition-fee. 3. Student who scored more than 55 marks in GATE will get 20% discounts on tuition-fee. 4. Gold Medalist from any institutions are eligible for 10% discount on tuition-fee. # Each student can avail one discount option only. # Class timing may vary and Batches may be merged as per the decisions of the management. #Exclusive Batches for IITs / NITs Students. 1. User-friendly and highly interactive online learning platform. 2. Live sessions with real-time interaction with our faculties for doubts. 3. Both Live Chats and Text options to clear your doubts. 4. Lecture backup are available in case you missed a class or need a revision. 5. Account remains active till examination with access to all the content till date. Enrollment Process : We intake limited students per session to maintain good interactions of student and faculties. Online admission facility is available to get Login-Access for this course. #Performance Test on completions of subject/subjects. Schedules are flexible and subjected to be change on management decision. On successful payment system automatically send e-receipt to given email address with details of Transactions. Send Transaction-ID with screenshots on WhatsApp at +91-7011648412 or at eiidelhi@gmail.com with Name, Phone no., & Transaction purpose. ENGINEERS INSTITUTE OF INDIA Pvt. Ltd.
1. The fee mentioned above is inclusive of GST & Postal charges (Courier/ Indian speed-post or parcel). 3. Study materials are available in printed booklet form & written in English language only. 4. Normally we dispatch major course materials in single shipment on next working day after payment confirmation. 5. No Postal charges would be charged if collected in hand from our admission office. 2. If the payment has been permitted by your bank, but the transaction does not show successful confirmation, then your payment will be refunded to your bank account within 15 working days automatically. Such transaction will be treated as non-payment and no study material will be issued against such transaction. 3. Postal Course or Study Materials once dispatched are non-refundable or adjustable in any case. 4. In case of Cancellations, cancellation charges of Rs. 2500 is applicable if reported within 4 hour from transaction. Solving tests regularly has always been the secret to all the rankers under top 100 in all previous year GATE examination. Through the feedback of those toppers and the knowledge of our experts, we have come up with a portal, which contains test papers to be solved by our aspirants. Our test series has been an imperative tool for All India Rankers since its inception. We have built sets of intricately arranged questions of both NAT and MCQ types to test the best in you. Every year 14000+ students subscribe to our test series to gauge their competition. 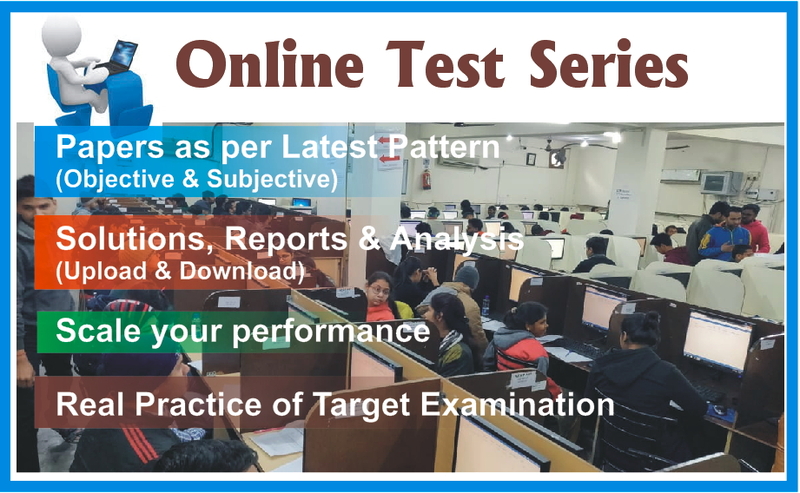 This is a comprehensive and intensive Test series designed for GATE 2020-21 examination, keeping in mind the trends of numerical approach which tests your conceptual & subjective knowledge. Test papers have been designed for complete revision & practice through Basics Level & Advance Level Test papers.
. User friendly interface with built in calculator and timer.
. Instant rank, performance report and percentile calculation as you finish the test.
. Tests can be taken at any time during the duration of preparation.
. Solutions of all the questions can be accessed at any time along with statistics.
. The portal can be accessed through smart phone, laptop and computers. We conduct Pre-GATE Offline Test at our own centre and allow all students (internal or external) to appear. This provides an administrative examination environment before real GATE examination. Eii is well known for the quality of test papers and many similar questions were asked in GATE 2019 and earlier. * Discount & Offers fee are subjected to be changed at any time without further notice. We reserve the right to change our product's prices at any time without further notice. 1. This Test package is free for all classroom enrolled students. 2. Fee is applicable for external students only. 3. Solutions & Test reports are available after two days from date of exam. 1. Visit http://ui.eiionlinetest.com & create your Username & Password to access your Test Series account. 2. Pay test package fee & share your Username with payment proof at eiidelhi@gmail.com for activation. We at Engineers Institute offer our aspirants with a course, which lies a class apart from the contemporary content available out there. Our course has evolved over years, carefully, under the supervision of experts and rankers. Our GATE + ESE+ PSUs course is a culmination of everything you need to learn to achieve those dreams that are a distant dream for everyone. Our strategically designed Combined Course starts with the subjects common between GATE and ESE with attention to both technical and non-technical syllabus. Our focus is to make the preparation for ESE a cakewalk for our aspirants. We organize information seminars with our ESE and GATE toppers from time to time to keep the motivation high and give our aspirants an opportunity to interact with the achievers face to face. Our Classroom Coaching Program hosts subject-wise and full-length tests very frequently to make sure that students are in synchronization with the competition. Above fee Includes GST, Study Materials, Test Series & Interview Guidance. We at Engineers Institute believe in every student and our team works hard with every student to help achieve the pinnacle. Thus, we have brought to you our Weekend Classroom Program for those students who want to start early while in college. Our weekend program targets 3rd year, final year and working professionals who aspire to crack both GATE and ESE along with their PSUs but do not have time to attend the regular classroom coaching program. Our content has been updated according to latest GATE/ESE syllabus and been normalized with the Regular Classroom coaching to maintain a uniform progress throughout the batch. The material is loaded with tons of numerical along with focus on both technical and non-technical segments. Our test series material are constantly synchronized for all the batches to provide you the best. We organize special Weekend Classroom Assessment test to help you gauge your strengths and weaknesses with respect to the competition. Best Course for Working Candidate. # As per GATE & ESE examinations schedule, per day class hours may be increased to complete the syllabus on stipulated time. 1. Student having 60% to 75% aggregate marks or equivalent cgpa in B.Tech / B.E are eligible for 20% discounts on tuition-fee. 2. Student having more than 75% aggregate marks or equivalent cgpa in B.Tech / B.E are eligible for 30% discounts on tuition-fee. 3. Student who scored 36 to 52 marks in GATE will get 20% discounts on tuition-fee. 4. Student who scored more than 52 marks in GATE will get 30% discounts on tuition-fee. 5. Student who qualified ESE-Prelim will get 40% discounts on tuition-fee. 6. Gold Medalist from any institutions are eligible for 40% discount on tuition-fee. Engineers Institute brings out for you the best that is required for an aspirant preparing for RRB-JE, in both Hindi and English. We at Engineers Institute have pioneered the domain of coaching our aspirants for RRB-JE by having expert faculty members and teachers who are working S.E in Indian Railways (IRSE). Our exclusive batches for RRB-JE lasts for 4-6 months during which our teachers ensure that everything in the syllabus is delivered to the students in an extremely simple language. Our aim is to make sure that every student who attends the classroom is able to understand all the concepts. We are having IRSE working professionals on our team to make sure that every student is attended properly. Our regular tests and doubt sessions are held to enhance problem solving skills and accuracy of the students. Our students from this coaching program are now working as JE /AE in Railways, BSNL, CPWD, Irrigations department, Electricity board, RITES, NALCO, UPPCL , NPTC, etc. Preparation strategy for 2nd stage CBT is not a very difficult task if done under proper guidance. We at Engineers Institute are here to provide you with best teachers and mentors, holding an experience of several years. Our faculty members working as IRSE are always there to ensure that a student gets what he aims for. We at Engineers Institute of India provide you with Railway Recruitment Board (RRB-JE) 2nd Stage Classroom Batch for branches of Civil Engineering & Allied, Mechanical & Allied, Electronics & Allied, Electronics & Allied and Computer Science – IT. Our faculty members are experts in their respective domain and make sure that every topic – from easiest to the most conceptual, is covered in classroom. Our classroom content is based on previous examination analysis, which makes it very important for an aspirant preparing seriously for such an examination. Our teaching language is kept very simple so that even the difficult concepts are properly delivered to every student. 1. Student having 60% to 75% aggregate marks in Engineering Diploma are eligible for 20% discounts on tuition-fee. 2. Student having more than 75% aggregate marks in Engineering Diploma are eligible for 30% discounts on tuition-fee. 3. Gold Medallist from any institutions are eligible for 40% discount on tuition-fee. We at Engineers Institute bring our classrooms to you! 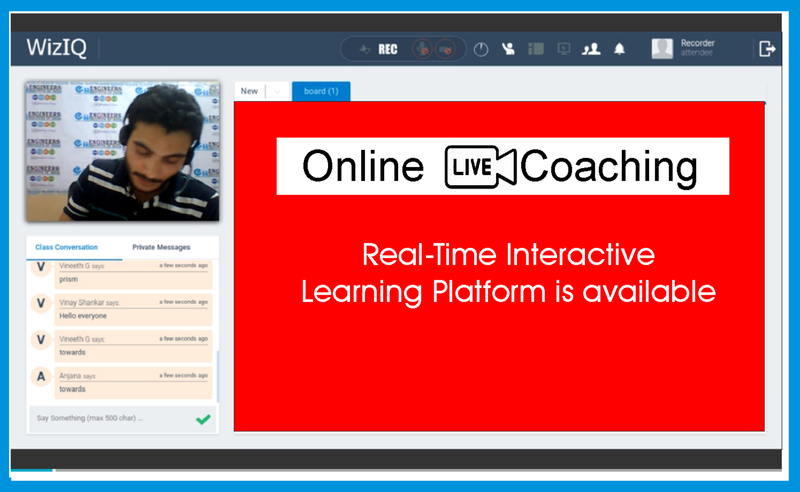 Through our Online Live Coaching portal for RRB-JE, you get to access unlimited content provided by us from your home, college, and job or even while travelling. All you need is an active internet connection and you can be a part of the gigantic online lecture series provided by Engineers Institute, which has been helping aspirants for years. The program is enabled with doubt discussion and real-time teacher-student interface. Our portal allows your lecture to be recorded and saved for future reference. We provide you with back up and a track of your old content so that you can begin off right where you left, without wasting your time. 1. User-friendly & easy to access interactive online learning platform. 2. Live Interactions with faculties for doubts via Text or Voice Chat. 3. Lectures are available in Backups for Views if not attended at real-time. 4. Our portal will still be functional at low internet speed on computer/laptops with common configurations. Engineers Institute offers exclusive Test Series for RRB-JE for both Stages – 1st and 2nd stage CBT, for all the aspirants, in a single package. You do not have to spend money for buying quality material for both stages separately. Our experts have coupled the content under a single package in which you get test papers that will prepare you for both stages. Our test series has an exhaustive collection of several topic-wise, subject-wise and full length tests. Your marks from the test will be immediately displayed and your performance with respect to the aspirants sitting all across the country will be gauged. Our tests can be taken from any device at any time from our user-friendly portal. 1. Test environment simulation, which is very similar to real examination of RRB. 2. Detailed solutions of every question available immediately after completion of test. 3. 24x7 accessibility of our portal till the date of examination. 4. Test reports, question analysis, rank, solutions can be viewed at any time. 5. Instant performance graph and feedback report generation. 6. Custom made questions fed into each test paper to make the test series realistic. 7. Accessible through laptop, desktop or mobile phone. 8. 12000+ Registered users on the portal which will give you the best idea of competition. Click-herefor Test Package details & its schedule. 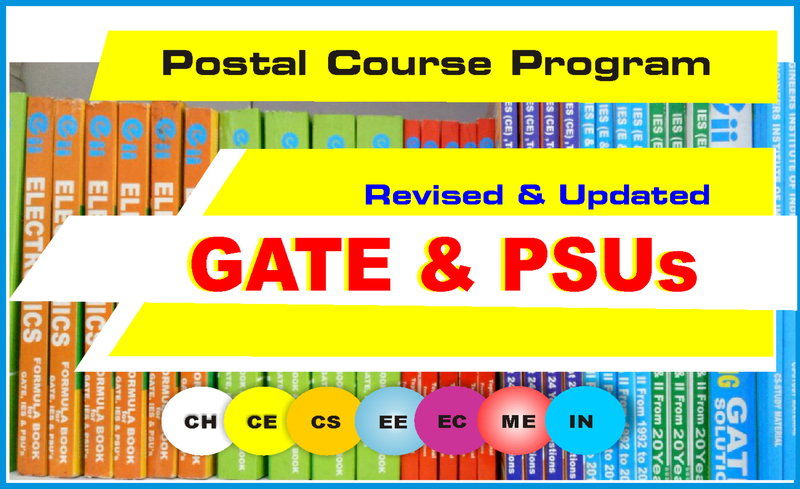 A proper study program designed for the preparations of Combined Courses (GATE+ESE+PSUs). As most of the students used to appear for GATE, Engineering Services and PSUs exams and major syllabus are common in technical & non-technical syllabus. We help you to prepare such topics in scheduled way to complete before examinations. We stress more on developing theoretical concepts with practices of different types of MCQ & NAT-Numerical Questions. We prepare through notes of each topics into classroom lectures and maintains the order of common topics to be covered first and rest topics subsequently. Our regular classroom assessment test will help you to diagnose the strength & weakness and develop tendency to compete others. We provide examination oriented Weekend Classroom Coaching Program designed for the preparations of Combined Courses (GATE+ESE+PSUs). This program is well suited for 3rd , 4th Year and working professional who can devote weekend on studies for competitive examination. As major syllabus of GATE /ESE- Engineering Services are common in technical & non-technical and preparation at same time can help you to achieve your goal. We prepare through notes of each topics into classroom lectures and common topics are completed first to boost the confidence to score in subsequent examination. Our weekend classroom assessment test will help you to diagnose the strength & weakness and develop tendency to compete others. Engineers Institute brings to you our exclusive classroom program with sole attention to latest syllabus of SSC-JE. Our course content designed by a team of our expert teachers brings out the best to suit the preparation required to crack this national examination. Engineers Institute has the facility of both Regular and Weekend Batches being held in our well-lit air-conditioned classroom, suited perfect for simulation of best learning environment. Our course content is structured in such a manner that even the toughest concepts will click you in a flash. We provide lectures available in both English and Hindi so that all our students get equal opportunity to learn from our experts. Our classroom batches are engaged with interactive sessions and regular tests to make the student thorough with the syllabus and difficulty level of SSC-JE. Standing a class apart, Online Live Coaching for SSC-JE provided by Engineers Institute takes nothing but an active internet connection and your device. Our Live classes are conducted by our teachers and can be accessed from your location. Our online coaching material is constantly normalized with classroom coaching material in order to bring every student of EII at the same platform after preparation. Our expert teachers take revision classes and discuss your doubts on while taking the class. Our content has been developed over the years by our experts and has shown several aspirants a way to success. Engineers Institute brings to you Exclusive Online Test Series for SSC-JE with over 50 test papers designed by experts. Our test papers are as per the latest syllabus and our user-friendly portal is loaded with unique features to ease your preparation. Each test paper is followed by complete information about your rank, relative performance, percentile calculator, solutions to each question, number of wrong and right answers and several more performance indicators which will help you measure your performance with respect to other aspirants preparing all over India. We also provide to you the facility for Demo tests. Give us a call and take your free Demo Test now! Largest Test Platform for JE/AE Level examinations. 1. Detailed solutions of every question along with statistical count of number of right answers after every paper. 2. Easy Access through laptop, desktop or mobile phone. 3. Realistic test environment simulation. 4. 24x7 accessibility of our portal until the date of examination. 5. Test reports, question analysis, rank, solutions can be viewed at any time. 6. Instant performance graph and feedback report generation. 7. Custom made questions fed into each test paper to make the test series realistic. 8. 14000+ Registered users on the portal which will give your performance relative to the best from all over India.